Individuals receiving waiver services may also be eligible for other supportive Virginia Medicaid services such as ID, DD and MR Waiver services. The individual or the legal guardian of the individual should contact their local Department of Social Services in their locality to obtain details and assistance. 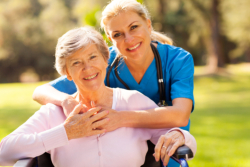 Assured Health Home Care, Inc. staffs are ready to assist you with any questions you might have concerning enrollment into Medicaid waiver.